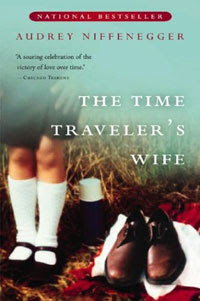 The first book for Boheem Book Club was The Time Traveler's Wife. We chose it because it seems to be a fairly popular read at the moment, and with the film just released it was 'time' to find out what it was all about. The Time Traveler's Wife is a love story about two people whose lives are overtaken by a genetic disorder: time travelling. As the name of the book suggests, the male protagonist, (Henry) is the one popping in and out of the past, present, and future; and his wife Clare is the one left picking up piles of clothes on the floor when he departs, and pieces of their lives as the confusion between predictability, predestination and hope gets the better of what is otherwise a seemingly normal, mostly healthy marriage. We felt that this book was overall an enjoyable read and we'd recommend it to anyone wanting a good yarn. It lacks the more delicate, poetic treatment of a story which jumps around in time which perhaps Michael Ondaatji (for example) has mastered. Its easy reading is a bit of a trade off with depth and resolve, and there are moments when it feels ever so slightly trashy, or even creepy (what exactly was going on between our naked 40-year-old Henry and 8-year-old Clare in her backyard?). Boheem gave this book three stars.